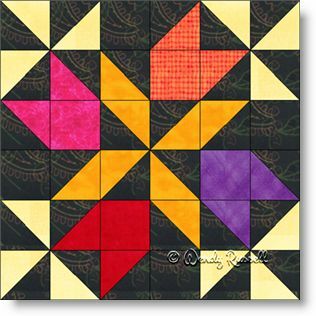 The Four Winds quilt block is a study in half square triangles. This block will test your sewing skills. Just note, that there is nothing difficult at all in the making of this block -- it just takes patience to construct all the patches. You will need to be very aware to sew an accurate quarter inch seam allowance due to the large number of cut pieces. Other than that, there is no difficulty here as the patches are most likely the first ones you learned to construct. The two sample quilts illustrated show two very different quilts -- one with blocks set side by side and the other with blocks on point and additional blank blocks (to showcase your quilting skills). Enjoy!